Precise polarization measurements of the Cosmic Microwave Background (CMB) radiation, an ancient glow from the early universe, may help scientists better understand how the universe rapidly expanded in a burst called “inflation” moments after the Big Bang. NASA is developing ultra-sensitive detector arrays to make highly sensitive polarization measurements in a search for a faint polarization pattern caused by gravitational waves produced during inflation. This technology will result in instruments that not only provide improved polarization measurements, but can be deployed on space-based missions, enabling collection of this data across the entire sky. The new technology uses superconducting antennas to gather polarized millimeter-wave radiation with high efficiency. The antennas are flat so they can be made into large-format arrays using photolithography methods. The radiation gathered by each antenna is dissipated as heat on a sensitive transition-edge superconducting bolometer, which has been cooled to a few tenths of a degree above absolute zero to minimize thermal noise. Changes in collected radiation produce small heat variations in the bolometer, which are in turn measured withmultiplexed superconducting amplifiers. A key aspect to the technology is the ability to scale the design to operate at a number of wavelengths in modular units, so that researchers can build a large focal-plane array for deployment on future space missions. Multi-frequency measurements are necessary to separate signals from the CMB from sources of emission in our own galaxy. 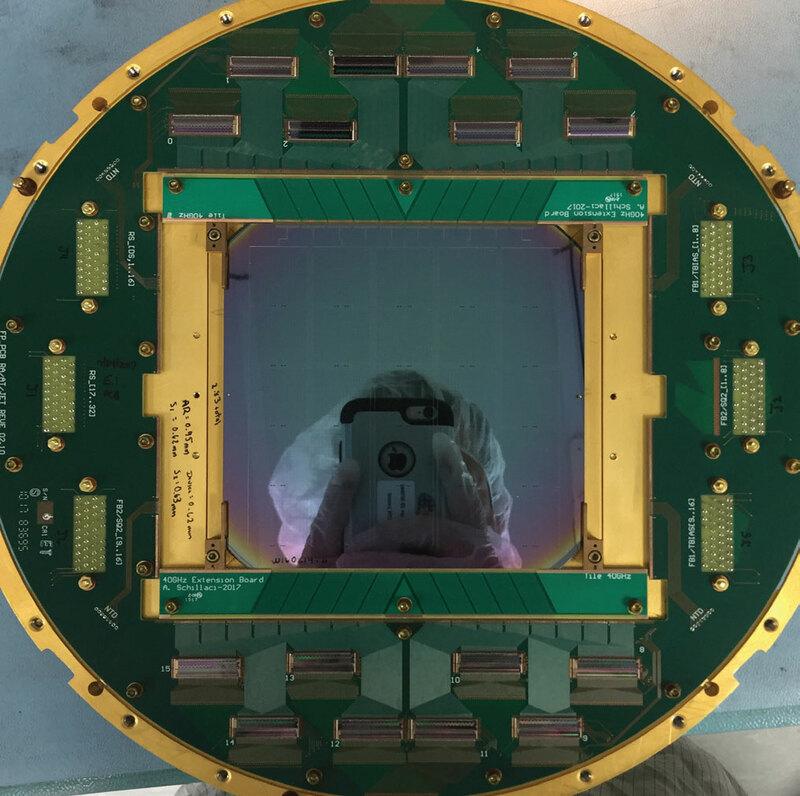 In 2017, the team extended this technology to larger wafer sizes, roughly doubling the number of detectors that fit in a sub-array. They also developed a new design for operating at lower frequencies, fabricating the first array of this type for observations at 40 GHz. In parallel, the team is developing a modular housing that enables construction of large focal planes made from multiple “sub-array” wafers. Demonstrations of these detector arrays from high-altitude ground-based sites and sub-orbital balloons will ready the technology for use in future space missions. 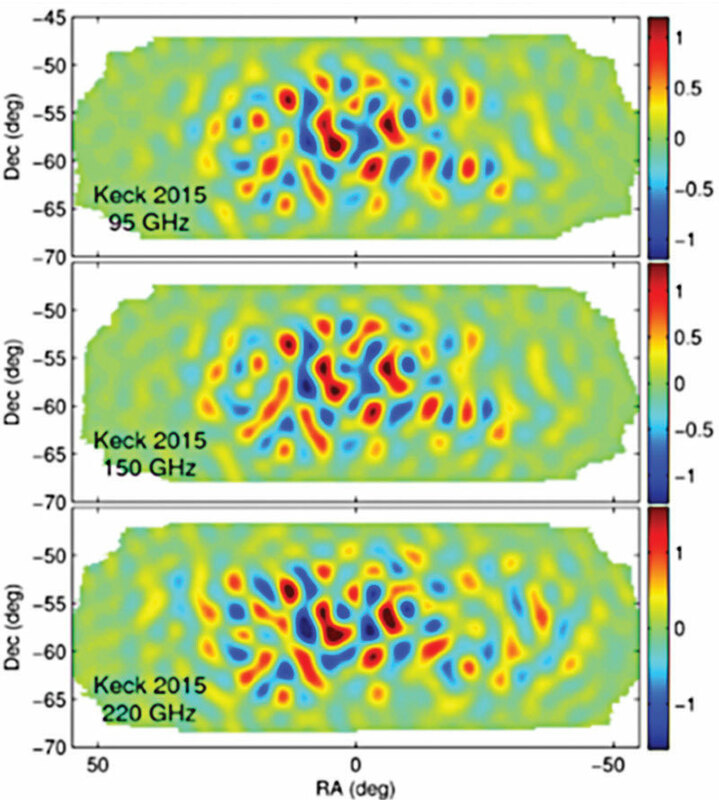 Recently published, precise measurements of the CMB in three frequency bands (95, 150, and 220 GHz) obtained using these arrays provide the tightest constraints to date on a polarization pattern from inflation. New arrays developed by the team are now operating at 270 GHz for the first time, which promises further improvements. Further advances are on the way, using a 150-mm wafer to develop larger array formats. The researchers expect ground and sub-orbital observations using the low-frequency 40-GHz arrays to begin in a couple of years to better measure galactic foregrounds. Since the detectors take up more focal-plane real estate at lower frequencies, the team is developing a dual-color design to squeeze two bands and two polarizations into a single antenna. Development of the antenna-coupled, transition-edge superconducting bolometer array is supported by the Astrophysics Division’s SAT program through a grant to Dr. James Bock at the Jet Propulsion Laboratory (JPL). The detectors are fabricated at JPL’s Micro Devices Laboratory and tested in collaboration with the California Institute of Technology and the University of Illinois.